Surface modification of fused silica windows caused by the ablation of surface-bound microparticles under short pulse laser irradiation is investigated and related to beam propagation effects. Particle material dispersal and subsequent surface pitting after multiple pulses of 351 nm, ∼9 J/cm2 laser light were found to depend strongly on material type and particle size. Surface pitting was most significant for opaque materials (aluminum, steel, acetal homopolymer), yielding pits as deep as 600 nm for ∼30 μm diameter particles. Transparent particles (PET polymer, glass) tended to disperse material more widely and caused less pitting (∼100 nm) than the opaque materials. 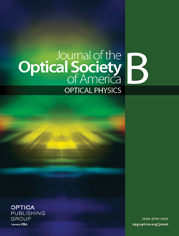 Paraxial light propagation analysis showed that phase objects created by ablated opaque materials resulted in higher peak intensification (∼3x) than those created by transparent materials (∼1.5x). The fragmentation of ablated material is discussed in terms of brittle or ductile failure at high strain rates, indicating reasonable agreement between experiment and theory. An approximation for the laser-induced plasma pressure and size of the dispersal pattern is derived, indicating an inverse correlation with material density.